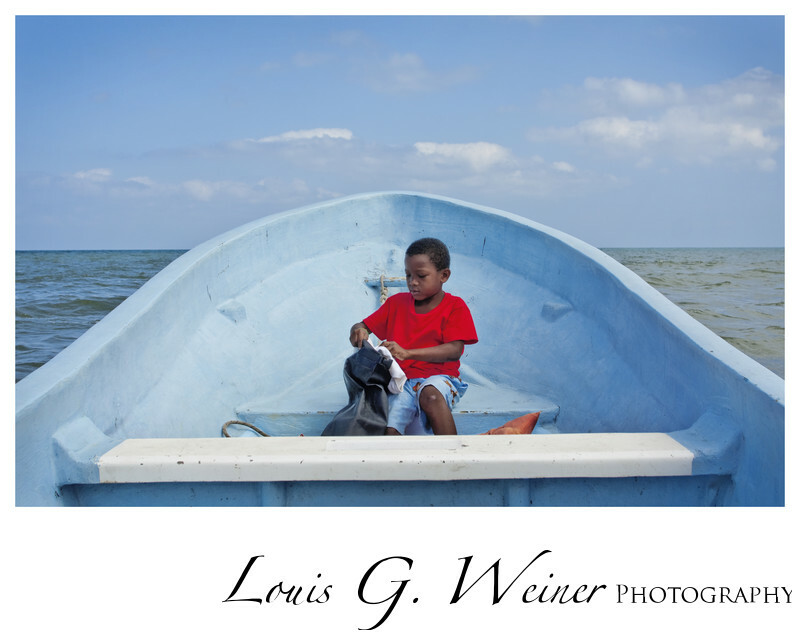 Travel Photography in Belize, on the way to Tobacco Caye off the town of Dangirga, Belize. This is Captain Doggie's boat and this is his son (I think he was playing hooky from school). The boat was about 14 foot with an outboard motor, I believe this is the only way to the Caye (Key). Captan Doggie was even listed in the Guide book. The island, Tobacco Caye, was very small maybe a foot ball field size. It is surrounded by coral reefs with only a small channel small boats can come through to get the to landing docks. I snorkeled off the dock right into coral reef, it was magnificent and so easy. I snorkeled everyday I was on the island, the tropical fish were many and within arms reach. I stayed at a small hotel with little bungalows, mine was $35 a day US and included breakfast and dinner. They caught a barracuda the day we landed, it was so fresh and wonderful to eat. We had that big fish several different ways at a couple of meals. Yum. Location: Tabacco Caye, Belize .